At long last, the iPhone and iPod touch have a Skype client all their own. This is a momentous turn of events, particular for iPhone users who haven’t opted for AT&T’s unlimited voice plan and want to save their precious minutes. iPod touch users will, of course, welcome the chance to add any sort of calling capability to their mobile device. Dial Tone: There are a lot visual similarities between the iPhone’s default dialer and the Skype interface. This mobile version of Skype looks and acts like the iPhone dialer—it might even cause some users to do a double-take. Quick chat sessions, powerful integration with the desktop version of the Voice over IP application, and better-than-expected call hosting make Skype for iPhone a must-download, even if it is missing some features. VoIP services such as Skype offer the promise of free phone calls—provided you’re calling other Skype users. Otherwise, you pay a few pennies per minute for international calls, voice mail services, and calls with anyone who is “out of service” (that is, those with a regular landline or cell phone not using Skype). You fill up your account with credits and away you go. Skype also offers a monthly unlimited plan that includes voice mail for just $3 a month in the U.S. The app mimics the iPhone dialer—in fact, it looks nearly indistinguishable. You can create an account on your iPhone, although once you are registered, the client itself only allows you to make calls, view and dial contacts, and send text messages or chats. To configure any other settings—or to buy more credits—you must use the iPhone’s Safari browser or any browser on your Mac. The beauty of using Skype is that you can view call and text message history, review charges, and listen to voice mail messages on your Mac—even if you receive them on the iPhone. 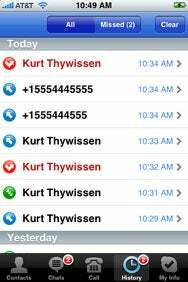 A Brief History: Skype keeps a record of all your calls and chats placed through the app and its desktop companion. Skype’s iPhone client only lets you make calls over Wi-Fi, not 3G or EDGE. (In fact, this restriction has raised the hackles of some advocacy groups, who have called on the Federal Communications Commission to investigate.) With the ability to make free or almost free calls comes a major caveat: call quality depends greatly on your service provider. During a day of testing on a home broadband line, most Skype-to-Skype calls were clear, but a few times there was an annoying delay or a digital chirp. In a lengthy call to a Skype user in Australia, the call quality slowly eroded over time. At a public library, Skype quality was fine during one part of the day, and then—when everyone around me was tapping away on laptops—Skype for iPhone was almost unusable. That essentially makes the Skype app an excellent back-up line to save iPhone minutes, but probably not a dependable first option for communicating with others. As a chat client, Skype is just okay. Bubbles look similar to those in iChat—they are colorful and cool—but you can only chat with other Skype users. There’s a couple other minor glitches: you can only participate in a conference call if another desktop-bound Skype user initiates it; you can’t start a conference call from your iPhone. And because the iPhone OS does not yet allow for background processing, you’re only logged into Skype when the app is running—meaning, if you want to receive a Skype call, the app needs to be open. Still, if you’re willing to accept those limitations, Skype is a fine, mostly no-cost way to extend the communication capabilities of your iPhone or add new ones if you have an iPod touch. 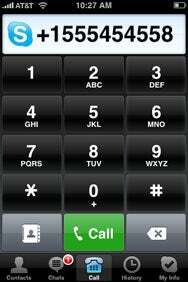 Skype is compatible with any iPhone or iPod touch running the iPhone 2.1 software update.